Tess Ward is a Le Cordon Bleu trained chef, food writer, lifestyle blogger and has just released her first cookbook, The Naked Diet. Tess took over the Marie Claire UK Instagram account to show us how to do avocados five different ways over five days – because who doesn’t love avocados? This is an easy and convenient healthy weekday lunch. 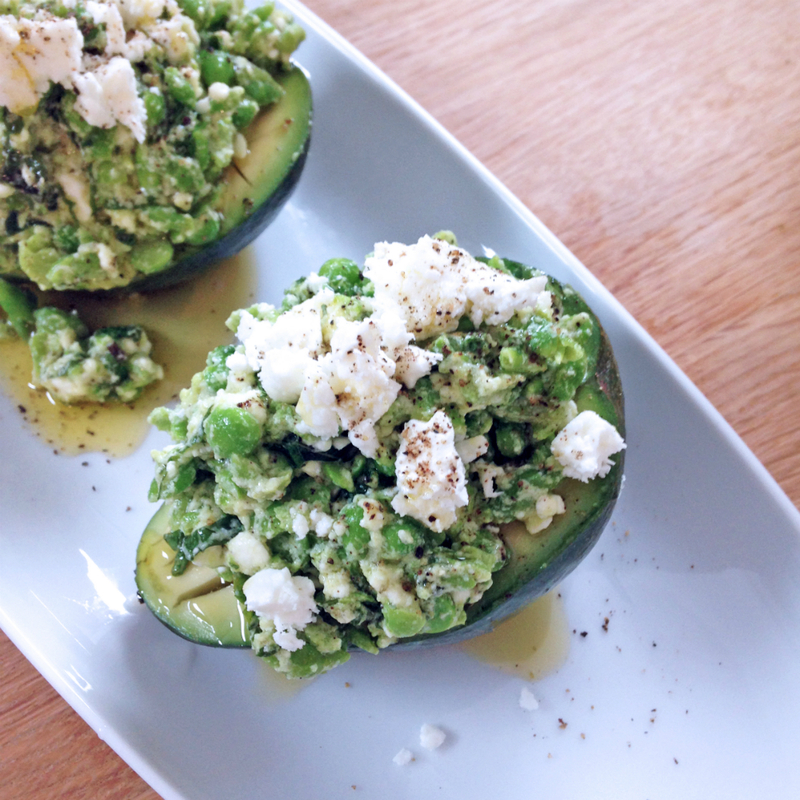 Make ahead the pea puree, pop and avocado in your bag and you can build your the boats at your desk. They are light and carb-free, yet still filling and totally delicious. Blitz the peas, feta, garlic, lime juice, mint and oil together in a blender. Alternatively, leave the peas to thaw and mash the ingredients together using a fork. If it’s too thick, add a little more olive oil or lime juice. Slice the avocados in half, remove the stones and score a few criss-cross slits into the flesh. Pile the pea purée high into each half. Add a good grinding of black pepper and a little extra feta, olive oil, lime juice and mint leaves. 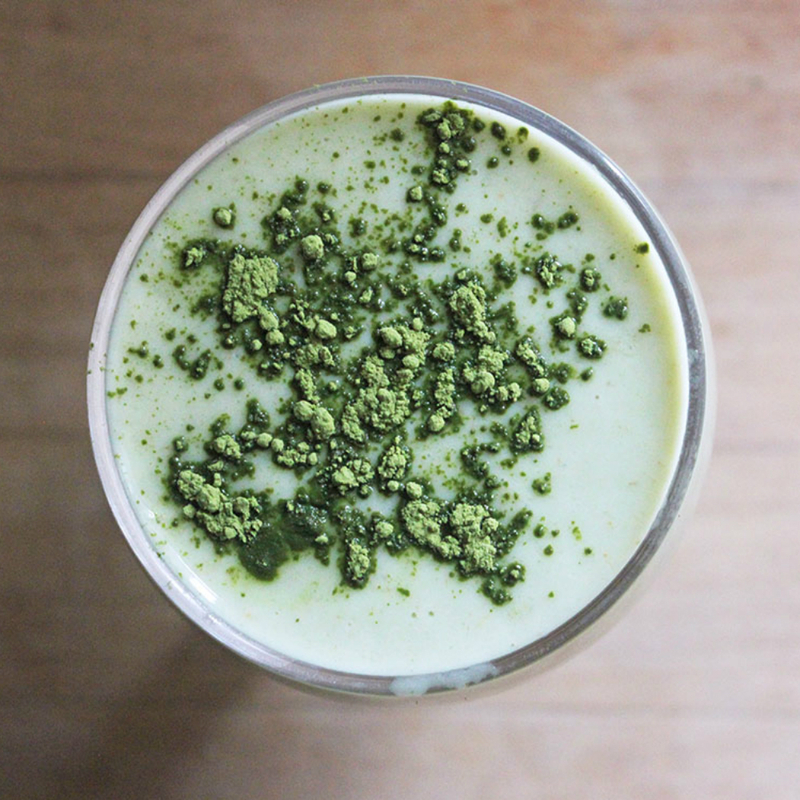 This smoothie is the perfect, filling thing to kick start your mornings. For non-breakfast eaters this is a lighter, convenient option. The avocado filling your body with beneficial fats whilst the matcha green tea gives you an energising caffeine kick. Put in a blender and blitz to perfection. Even avocados lend themselves to the barbecue in summer. The trick is to use ones that are just underripe to ensure best charred texture and minimal messy squish. 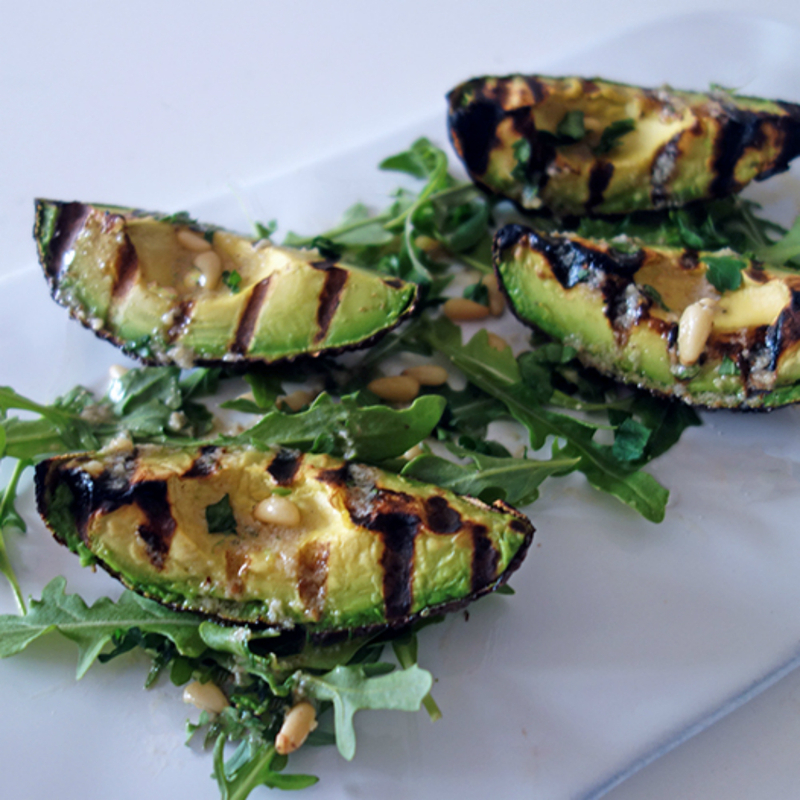 If barbecuing, place the quarters of avocado on the hot grill for 2-3 minutes, then flip and cook on the other side. For kitchen cooking, heat a griddle pan over a high heat. Once hot, and nearly smoking, add the avocados to the grill and cook until charred on each side (about 2-3 minutes). You might want to gently press down on them to ensure each side makes good contact with the grill. You will know they are done when they have good char marks. Make the dressing by placing all the remaining ingredients (aside from the rocket) into a blender and whizzing until combined. Alternately you can use a pestle and mortar. Add a pinch of salt to the pestle and mortar with the garlic and pine nuts to help bash to a pulp. Gradually add the olive oil and lemon juice. Mix/bash until the dressing looks like a thick rustic pulp. This dish is the perfect way to use up over-ripe avocados. The sort that are past their best but remain just are green enough to warrant saving. It is also super fast and easy to make. I often make a double batch of the pesto and keep it in the fridge ahead of time for open sandwiches or to dip with crudites. It is best to eat the pesto within 24 hours, otherwise the oxidised avocado starts to discolour. Fill a large saucepan with water and place it on the hob over a high heat. Bring to the boil and add a good couple of pinches of salt. Once the water is at a rolling boil, add the pasta to the pan and cook according to packet instruction. Meanwhile, place the avocado in a mini blender, or nutribullet with the parsley, walnuts, garlic, lemon, olive oil and chilli flakes (if using). Add a big pinch of salt and blend on a high speed until well combined. If need be add an extra glug of olive oil to get the mixture to whip into a smooth creamy texture. Taste and adjust the flavour if need be. Add a little more salt, a good grinding of pepper and perhaps some more lemon juice. Once the pasta is cooked, save 1/3 cup of the water and drain away to rest. 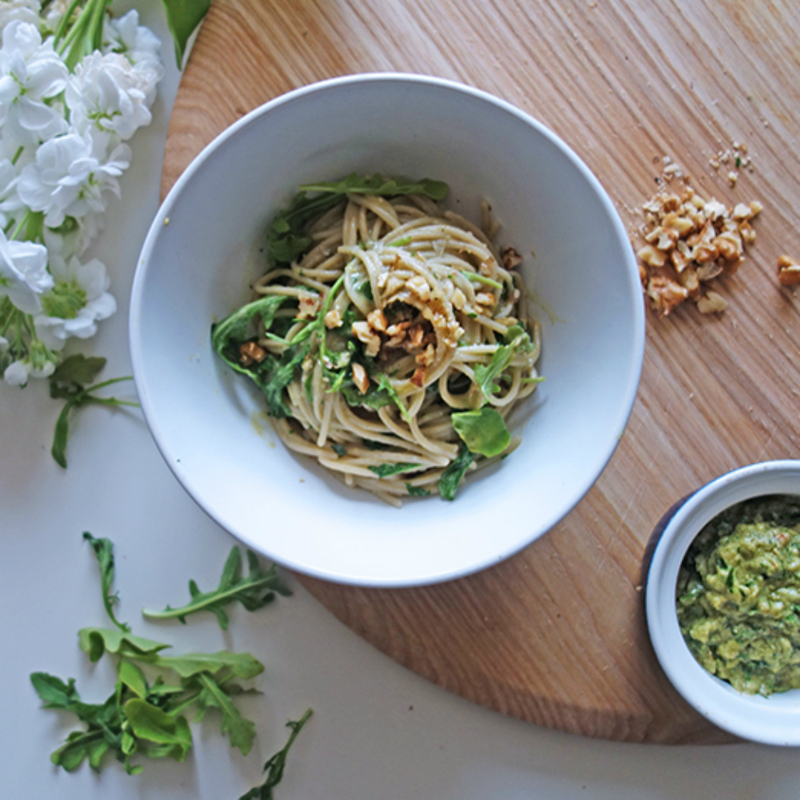 Place the pasta back into the saucepan with the pesto and half the cooking water. Mix well, adding as much of the cooking water that is needed to lubricate the sauce. Season with sea salt and pepper. Finally stir through the handful of rocket and divide the pasta between two bowls. Finish with a sprinkling of walnuts and a final drizzle of olive oil and dig in, before it gets cold. This light and summery salad is great served warm or chilled. It makes a great side to have with anything from barbecued meats to simple grilled fish. Add the quinoa to a sauce pan, and cover with 500ml of water. Put the pan over a medium heat, bring the water to boil, then reduce to a low simmer. Cook with a lid on, for 15-20 minutes. Whilst the quinoa is cooking, remove the edamame beans from the freezer, put them in a sieve and rinse under a cold tap to defrost. Rinse the asparagus and snap off the woody ends – at the bottom, where they break naturally. Once the quinoa is cooked, turn off the hob. Add the asparagus to the pan and put the lid back on. Leave them steam for a couple of minutes. You don’t want to fully cook the asparagus, just soften it slightly. When the asparagus is looking vibrant and green, remove them from the pan. Slice them in inch sized pieces and set aside. Add the edamame to the quinoa and toss through. If the edamame isn’t fully defrosted return the lid to the quinoa and leave to one side for 10 minutes. The partially frozen edamame will cool down the quinoa. 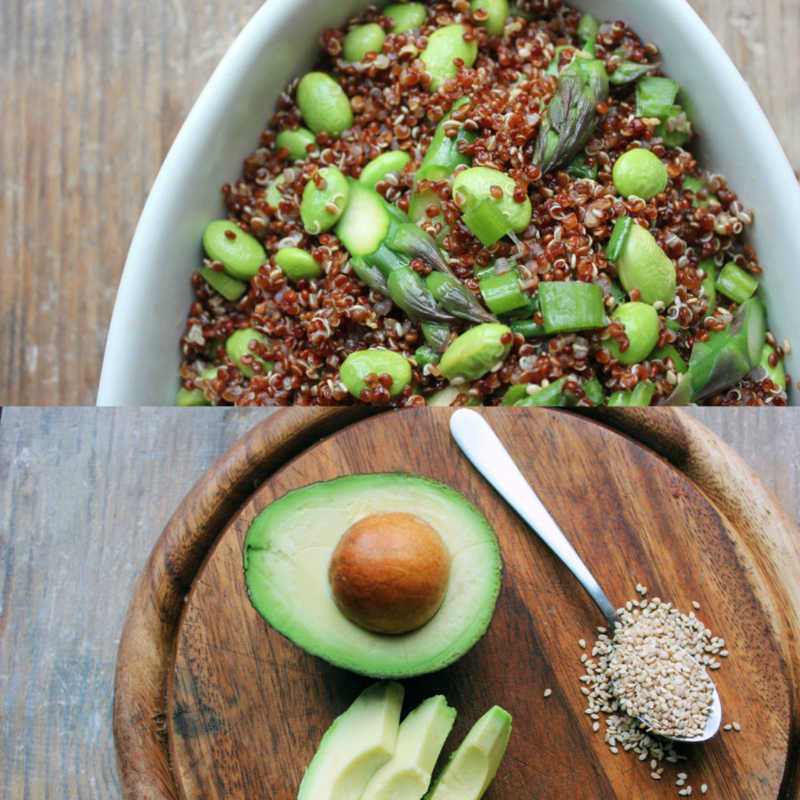 Return the asparagus to the pan with the quinoa, add the avocado cubes, dressing and toss to combine. Turn the mixture into a serving dish, scatter over the spring onions and sesame seeds-and enjoy.